What do we know about the local interstellar medium? Our sun (and solar system) are currently moving through a cloud of interstellar gas. This cloud is approximately 60 light years across, with our sun being only appoximately 4 light years from the edge. Our local cloud, which features a density of 0.1 particles per cubic centimeter, and a temperature of about 6000-7000 K) is immersed in the "Local Bubble," which has extremely low densities (approximately 0.001 particles per cubic centimeter) and very high temperatures (approx. 1,000,000 K). The local bubble is about 300 light years in diameter, and may have been created by a supernova explosion. How do we know about this? The material from our local cloud can be sampled within the solar system, a process you learned about in the previous section of this tutorial. Our sun is moving through the local interstellar gas cloud approximately into the direction of Scorpio with a speed of about 25 km/sec. As a result of this motion, an interstellar wind with that speed is blowing through our planetary system. This is similar to the wind felt while driving a convertible car with the top down. We measure this interstellar wind as helium, and the density of helium changes with our year, an effect that can be seen in this brief animation. Please visit the Solar Journey home page for an animated explanation of the sun's interaction with its surrounding material. The newer view, that there is not enough time for the atoms to lose their electons and become charged as the sun rushes through the gas, is similar to the idea of quickly moving your finger through the flame of a candle and not getting burned (as seen in the picture to the right). Typically, there is 1 atom in each 10 cm3 of interstellar gas and 10 ions in each cm3 of solar wind (near Earth). The particles are so far apart that the solar wind and interstellar gas flow through each other without being disturbed by collisions. Therefore, we can even take samples of the interstellar gas near the Earth. To see an animated explanation of what you have just read, please watch part one of our movie regading the topic. 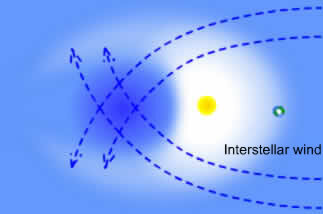 The interstellar atoms change their behaviour as soon as they are ionized. This happens more frequently closer to the sun, where sunlight gets more intense. The Sun's ultraviolet (UV) radiation is the most important player in this game. The newly-created ion, with its positive electric charge, can no longer cross magnetic field lines. Ions are forced to gyrate around a field line, like a gymnast swings around the horizontal bar in the Giant Swing. (To see an animated explanation of this, please watch part two of our movie regading the topic.) These interstellar ions are called "pickup ions". They are an excellent tool for determining the density of the local insterstellar cloud, and to help us find out of which elements the interstellar medium consists. To see an animated explanation of what you have just read, please watch part three of our movie regading the topic.